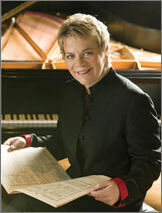 In September 2007, Marin Alsop made history with her appointment as the 12th music director of the Baltimore Symphony Orchestra, the first woman to head a major American orchestra. This mirrored her ongoing success in the United Kingdom where she was Principal Conductor of the Bournemouth Symphony from 2002-08 and is now Conductor Emeritus. Ms. Alsop also continues her association as Conductor Laureate of the Colorado Symphony following 12 years as Music Director, and since 1992 has been Music Director of California's acclaimed Cabrillo Festival which has won the coveted ASCAP award for Adventurous Programming of Contemporary Music every single year since her appointment. Ms. Alsop is a regular guest conductor of the New York Philharmonic, Philadelphia Orchestra and Los Angeles Philharmonic. She is also one of the few conductors to appear every season with both the London Symphony and the London Philharmonic, and has conducted many other distinguished orchestras worldwide, including the Royal Concertgebouw Orchestra, Zurich Tonhalle, Orchestre de Paris, Bavarian Radio Symphony and La Scala Milan. She has been profiled in Time and Newsweek, appeared on NBC's Today Show, and was featured as ABC News's "Person of the Week". Marin Alsop is a native of New York City; she attended Yale University and received her Master's Degree from The Juilliard School.